Episode 35 is here and it's with someone who I've been following for a very long time, because her story, is an MS story. Whenever I need a little bit more encouragement or inspiration or hope that there is still more I could do to help my body heal dramatically from chronic disease I look to The Texas Fruitarian and Rebecca Rosenberg. As mentioned above, Rebecca was vegetarian for many years and then vegan prior to being diagnosed with Hashimoto's Disease and so when she was left numb down her left hand side due as a result of what she would discover was a diagnosis of MS, she knew being vegan alone, wasn't enough to heal her body. Whilst still in hospital, Rebecca made the decision to go completely RAW FRUITARIAN and she's currently far beyond one thousand days fully raw and thriving symptom free from her MS and Hashimoto's and as an added bonus, she has also lost a whole pile of weight and is looking and feeling better than she has in her life! If you haven't yet SUBSCRIBED to this podcast, head over to iTunes or Stitcher App for Android and SUBSCRIBE because I put out new episodes every Sunday/Monday and if you could leave a 5 Star Rating and a kind REVIEW it would really help this podcast and these messages of hope to reach more people out there who might desperately need to hear these stories. 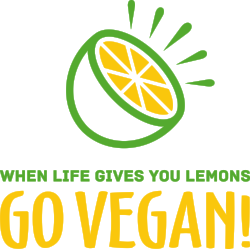 Also, if you'd like to keep up to date with everything happening on the podcast, you can head over to Facebook and LIKE the When Life Gives You Lemons, Go Vegan Page for all the latest guests, updates and episodes all in one place! Thanks so much to Rebecca for sharing her story this week and thank you all so much for listening and supporting this podcast. If you have any questions about this weeks episodes or any of the other episodes of this podcast, please feel free to leave a comment after these show notes and we'll do our best to reply as soon as possible to your questions. Lastly, if you enjoy this podcast, please SHARE it on social media as you never know who might read it in your circle and you may just help one of your friends and families to make a huge difference to their own health whilst simultaneously helping to save some animals and the planet!